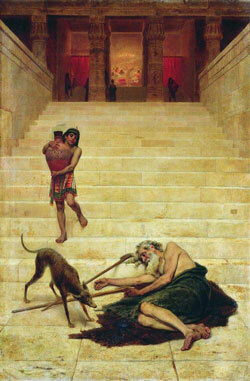 Our Gospel today tells of a rich man who needed to have his eyes examined. This rich man went through life unable to recognize a brother in need who was right at his door. How many times do we go through life so consumed by and preoccupied with ourselves and the tasks at hand that we fail to notice our brothers and sisters who need our help? Lent calls us to slow down and notice others—especially the poor—in order to help them. Jesus was particularly great at this. He always took the time to recognize others, especially in their moments of pain and sorrow. If we are going to make this world a better place, we cannot be indifferent to those in need. We must reach out and be the presence of Christ to them. The good news is that we are “the brothers” being warned. Jesus has risen from the dead, and today He calls us to repent from our sins so that at the end of life we may find ourselves rejoicing in the bosom of Abraham.